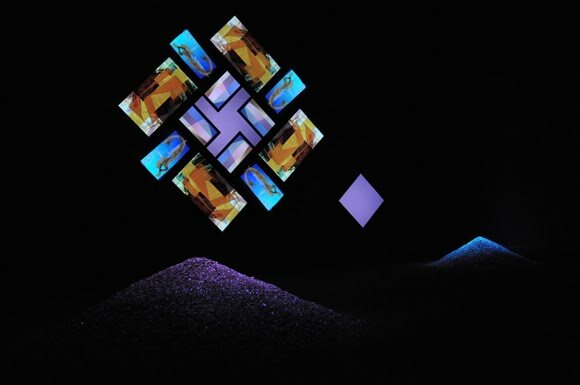 I've been salivating to see Brian Eno's 77 Million Paintings exhibition at the Glenbow Museum, ever since it launched during last month's High Performance Rodeo. So yesterday I coerced my local culture vulture buddy, Urban Blonde, into making a trek out of the burbs and into the lifeblood of downtown, where we spent the afternoon museuming. I've been to the Glenbow many times, and have seen some highly compelling exhibitions there, but yesterday's pilgrimage ranked up there with one of the most memorable and artistically satisfying. In fact, it was the polar opposite of today's trip to the dentist. Oh, the dental work itself was easy - just the replacement of a crown - but they were running behind due to an earlier dental emergency, and I had foolishly forgotten to pack a book or the newspaper into my bag. So while I waited in the chair, the hygienist kindly brought me a couple of magazines. People and Star. I thought I was going to die, flipping through those. Seriously, I came out of that chair, feeling like I had just shoved a giant bag of pig snacks into my brain. Not only did I not know who half of those celebrities were, but I really couldn't get all that excited about their nails. Fortunately I could close my eyes and slip back into the trance that 77 Million Paintings put me into. It's a spare simple exhibition - a large darkened room with comfortable couches facing a wall on which a large quilt-like display is projected. Against a sonic background of Eno's meditative ambient music, the display shifts, continually and almost imperceptibly. It's an installation that I found to be simultaneously relaxing and exhausting. On the one hand, I could feel my pulse rate and blood pressure drop almost immediately as I gazed upon the art and let myself get lost in the music; on the other hand, I found myself concentrating so hard upon a specific frame, trying to capture the shifting patterns, that when I glanced at a different frame and found that it had completely changed from a few seconds ago, it felt shocking. We actually sat through the installation twice, for at least twenty minutes each time. Maybe half an hour, I don't know; time became meaningless. I was a bit disappointed with the Perceptions of Promise: Biotechnology, Society, and Art installation, to which I had really been looking forward. Some of the pieces were quite haunting. The cell tent was really cool, and Split Petcetrix, with its layered and bejeweled human form addressing the questions of profit within the areas of liposuction and stem cell harvesting, was particularly effective. But personally, I think that there is so much inherent beauty within purely scientific images, that I was disappointed not to see at least some electron microscopy within the exhibition. Elsewhere in the Glenbow, Stephen Hutchings' Landscapes for the End of Time was quite stunning, partly because of the vast enormity of the landscapes in the exhibition, partly because of the timeless and placeless feel of the pieces, and partly because one of them reminded me of the Enchanted Forest at UBC where everybody goes to smoke dope. I was especially thrilled to see an installation containing two pieces of art from a talented Winnipeg artist whom I happen to know personally. Back when I knew her, and when she was introducing me to her pets (and artist models) - a couple of enormous Madagascar hissing cockroaches - Diana Thorneycroft used to produce the most amazingly intricate line drawings which looked lovely on the surface but which always contained something slightly disturbing. The photographs exhibited at the Glenbow are from Diana's Group of Seven Awkward Moments series, which reinterpret iconic Group of Seven paintings through the addition of burning igloos, abducted monkeys, and chainsaw bearing Ken dolls. These pieces may be blasphemous to those who view the Group of Seven as untouchable national treasures, but I think they are delightful. You should go to the Glenbow Museum before the end of March, when these exhibitions end. That's where you will find the heartbeat of the city, the antithesis to dental office magazines. Sounds like my kind of exhibit. Never underestimate the power of a seating with a gallery space. So many museums/galleries forget this. Sometimes people just need to sit and soak it all up. My favourite thing when I was living in England (where going to a museum/gallery is FREE), was just going in and sitting in front of a painting. We need to make our art more accessible here. Museums and galleries are free in England, Al? Oh how sweet! I would be there every week if that were the case here. I completely agree about the need for comfortable contemplative seating. I envy all the cultural stuff that you get to see and do. We have no cool galleries here in Johnson City. It's been years since I've visited the Glenbow. Usually when I visit Calgary it's a stop-over before a serious appointment with some trout and a fly rod, something I hope to do again soon. Come up and visit, Dr M, and I will take you to all my favourite haunts. Mr Anchovy: the next time you come out to visit the trout, give yourself an extra day, and I'll take you to the Glenbow. I always love spending time in galleries and museums - it is so good for the soul and just a great way to spend the day. It is, Kathy, and there are so many galleries around here that I haven't even visited yet. Next time you are out here, you have to help me remedy that.